The government makes the ultimate decision about what is sacred while American Indian beliefs fall to the wayside. To American Indians, all that is natural is sacred — including the land. While many religious denominations build churches or temples, American Indians simply worship what is. Unlike those buildings, the lands Native peoples find most sacred often go unprotected. Defining the sacred is complicated. In the United States, there are more than 500 distinct American Indian cultures, all of which have different ideas about what is considered sacred. Larger sites in South Dakota, such as the Black Hills and Bear Butte, are widely accepted as sacred by most of those cultures. Smaller sites, however, are defined by specific — often individual — tribes. It’s those little-known sites that tend to be overlooked. “It’s not a singular culture. Federal agencies need to consult with tribes. As people, we need to sit down and listen and decide how to deal with the sites,” said Albert LeBeau, III, a member of the Cheyenne River Sioux tribe and a National Trust advisor for the National Trust for Historic Preservation. The difference between the federal and American Indian understanding of the sites comes back to the issue of land: the government sees land as property, while tribes see it as the essence of creation. “The problem is the government, instead of tribes, designate the places to be considered sacred,” said Brian Molyneaux, assistant professor of anthropology at the University of South Dakota. The Great Plains are home to between 20 and 30 American Indian tribes. They are widely referred to as Plains Indians, and share some of the most well-known sacred sites. Think Mag visited Bear Butte and the Black Hills to learn more. From an aerial view, the entirety of the Black Hills looks like a human heart. The stories differ from tribe to tribe, but for most Plains Indians the Black Hills is a central sacred space. The development of towns and roads throughout is deemed as the ultimate violation. 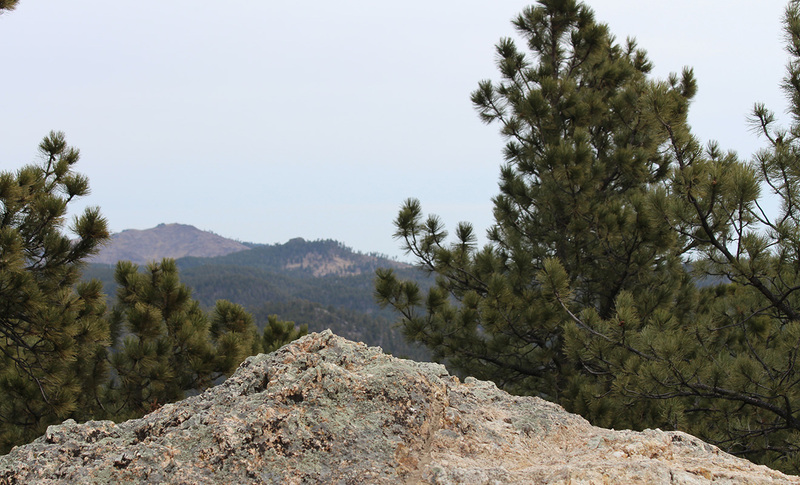 Since the takeover, tribes have been fighting for protection of the Black Hills. “We’ve been offered a monetary value for many years,” said Gary Parisien, a member of the North Dakota Ojibwe tribe. He equates this offering to the government attempting to buy a religious building such as a church or temple. It would be, he said, like buying their religion. And it’s for a similar reason that many disapprove of the construction of Mount Rushmore in the Black Hills. The land within the Black Hills is more sacred than most. Mount Rushmore was built in a way that disturbed that space in order for it to be set up as a tourist destination and a money-maker. “It’s all about control; ideological and behavioral control,” Molyneaux said. Bear Butte is one of few government-recognized sacred sites and has been set up as a state park in order to protect it. For the 20 to 30 Plains Indian tribes, the Butte is part of their creation story. Parisien says Native peoples often use Bear Butte for their Vision Quest and to get closer to nature. The length of a Vision Quest varies from tribe to tribe, but typically last three to four days. That timespan gives the quester enough time to fast, prepare and complete the Quest. The Creator shows questers a deeper understanding of their life purposes through providing vivid visions or dreams. For American Indians, visiting a sacred site like Bear Butte or the Black Hills is private, personal and powerful. It’s a way to get closer to nature and their Creator. Prayer ties are one of the ways they honor their beliefs. “[Prayer ties] are individual offerings to god. It’s like communion in reverse,” LeBeau said. The ties are pieces of fabric in symbolic colors that are tied to trees. Black, red, yellow and white represent the four directions; blue and green represent the sky and the earth. Offering prayer ties in a sacred place makes one’s prayer even more powerful. And the closer it is to the sky, the closer that prayer is to the Creator.